To rhythmic games may be attributed the freedom of movement, graceful carriage and appreciation for and response to rhythm by which the child attempts to give expression to his inmost feelings. By correlation with language, quiet games furnish a successful means for establishing correct habits of speech. Correlated with number, much valuable drill in the fundamental processes may be secured in a most delightful and informal way. All children love to play, and, cosmopolitan as is the blend of our public schools today, in the recreation period is found an opportunity for universal expression not afforded in other activities of the day. Keenly sensitive to their surroundings, they are quick to catch the enthusiasm of their leader. The child, timid and retiring of disposition, becomes a creature of initiative, while not infrequently the forward, self-assured child is given a much needed lesson in self-restraint. Through his skill displayed in playing games involving contest, a formerly unappreciated child compels the respect and admiration of his classmates, a tribute that may play no small part in influencing his course in after life. It is only by getting into the game with the children and encouraging them to play naturally, permitting them to get all the joy there is in the performance hereof, that games may be made of greatest service. The effects of such play cannot fail to dispel the artificial atmosphere which for various reasons permeates many of our schools today, and to establish, in its place, wholesome and natural conditions, that will challenge the child's best efforts and render school life pleasant as well as profitable. 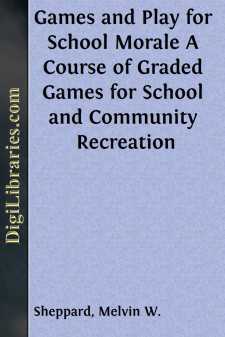 While the plays and games listed have been carefully arranged and graded with a view to adapting them to the schoolroom, many of them are suited to playground, hall and gymnasium use. It is suggested that at least one game period a day be given out of doors during the pleasant weather. 2. Teach by imitation in the story-plays and rhythm, as best results come from the teacher playing with the children.